This is luxury central apartment with a lot of natural light located on the main shopping street of Gothic Quarter. 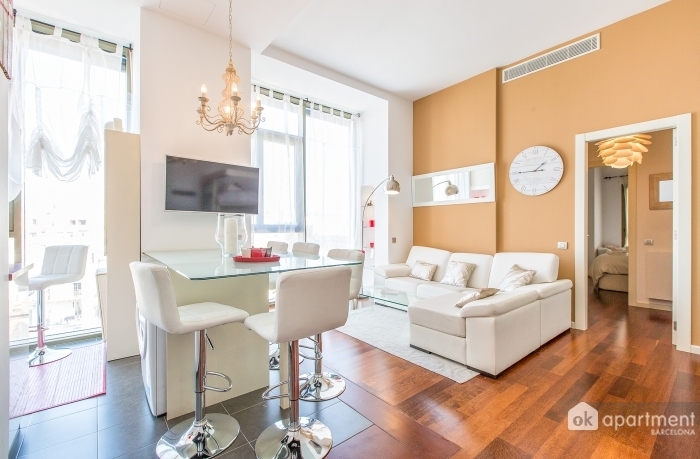 This spacious apartment of 70m2 is perfect for couples or small families. It consists of large double bedroom and a living room with another single bed. In the kitchen you will find an oven, toaster, coffeemaker, freezer and refrigerator. The whole apartment is fully equipped including air conditioning, TV, washing machine, Internet Wi-Fi. As additional amenities there is a terrace with a swimming pool and gym on the rooftop. Included in price: Internet WiFi,	Shared swimming pool. Extras: Cot: 30 € per stay .